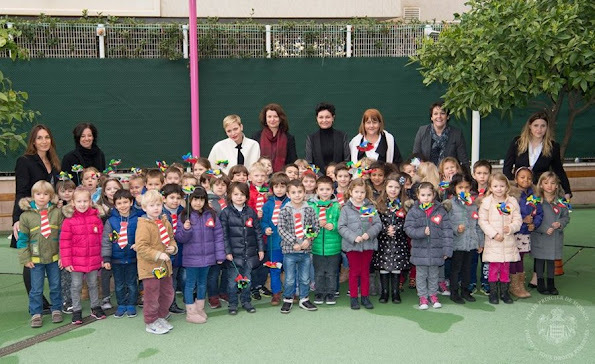 This morning, Princess Charlene of Monaco visited the nursery school of Monaco and the college 'Charles III' where the South africa children met the children of the college, they are part of the South Africa Monaco rugby exchange, she gave also a lesson of swim to the children. 25. February 2016.
ze is zo gelukkig!! ze heeft heel veel meegemaakt ,zo veel leugens verteld . maar ik heb ook gelezen,dat ze zei dat ze een hele goede man heeft ,en gezonde kinderen!!! I don't think she looks lovely, but I think she has a lovely character somewhere inside her... I like to see her doing what she loves! i think she has a real rapport with these people. you can see by their reactions. real classy woman, well done prince Albert! I didn't know there were so many non-whites in Monaco.